The quote comes from the Metal Gear Solid series of games. The series is the brainchild of Hideo Kojima and the man has directed every single Metal Gear Solid game but that was before his falling out with Konami. It’s hard to say what Konami will do with the series now that Kojima is out of the picture and it’s difficult to see if other Metal Gear Solid games will actually be good since a lot of what made the games great was Kojima’s rather cinematic way of telling a story… which is probably why the man with the “Snake” codename (whether it be Solid, Snake or Naked Snake/Big Boss) says the quote in practically all installments of the game. Geek wisdom: Patience is a virtue. It can be maddening to be waiting for something to happen but, most of the time, the wait will be worth it. The story behind the quote: The quote comes from, Silent Hill 2, a Konami game that was released before the company was still heralded as one of the best in the industry and before the entire #fuckonami movement. 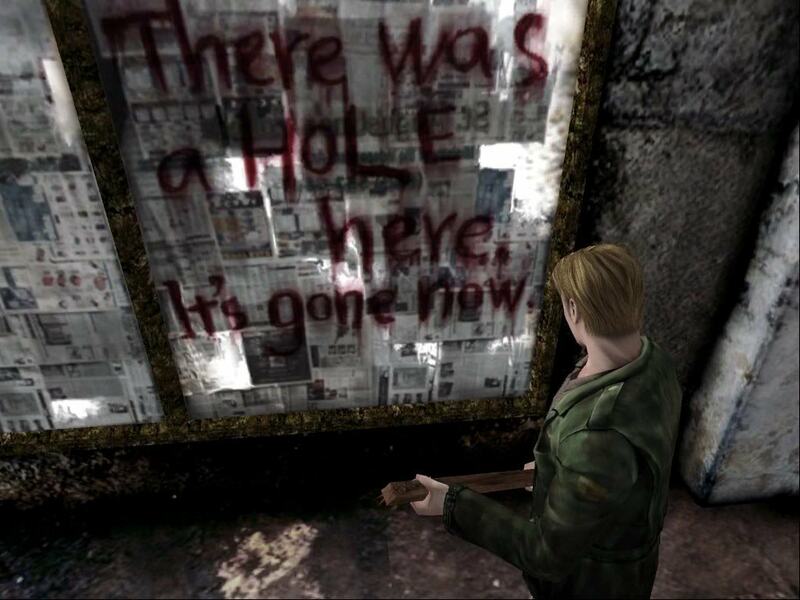 The game revolves around James Sunderland, a recent widower, who receives a letter from his deceased wife, Mary, to return to the town of Silent Hill. Of course, the instant James enters the town, things go frighteningly wrong. The quote comes early in the game. James explores Silent Hill and comes across Neely’s Bar. In the bar, he gets a vital item that helps him push through in the game. But also, scrawled on the newspaper covered windows, is the quote. Side Note: When I played Silent Hill 2, I can vividly remember going to Neely’s Bar in the “Otherworld” first. I do recall seeing a hole on that very spot but James didn’t want to go through it. This is why I returned to the bar after returning to the “normal” world. This was when I saw the quote… and it really creeped me out because it was like the game knew what I wanted to do! Geek wisdom: Things change. Landmarks and old hangouts you used to love going when you were a younger may not be there anymore when you get old. You can drift away from family and friends you were close with before. We never thing about the possibility they may be gone in an instant. Cherish the time you have with the people and places you love. Enjoy spending time with them while they are still on this earth… and not the Otherworld. The story behind the quote: This quote actually comes from an Easter Egg from Lifelife for the Playstation 2. This survival horror game from Konami is remembered because it was a good game (most reviews gave it an average score). Rather, what made his PS2 game memorable was its unique control scheme. It takes place in the future where you are attending a party in a hotel that is orbiting the Earth. The festivities are abruptly put on hold due to invasion of alien monsters. Your character gets trapped in the control center of the space hotel. Your character manages to make contact with another survivor named Rio (voiced by Kristen Miller). However, you can only communicate with her by actually talking to her. As mentioned, the game was pretty different from other survival horror games because of the way you control Rio. The player cannot use the controller to issue orders to Rio. Rather, you would have to use a PS2 USB microphone and give the commands by talking to her. The concept was good… but the execution was bad. The game simply couldn’t keep up, especially if you issue commands hurriedly. However, using your voice to control the onscreen character was used in weird ways, especially with the aforementioned quote. At any time during the game, you can command Rio to bark like a dog for no reason at all. The weird thing is that the developers actually thought of this and Rio has a response for it! The video below has Adam Sessler reviewing (and blasting) the game. You can skip to 2:03 of the video to here the sequence and the quote. You can clearly see that Adam didn’t really expect a response! Geek wisdom: Sometimes, taking a weird and irreverent chance can make you stumble on to something good. In the game, there is really no reason to ask Rio to bark like a dog. It’s something generally something someone would do on a whim… and it actually works! We can get too focused on our own lives and get too serious. Because of this, we forget that being spontaneous and irreverent… just doing something for no reason… can also be fun. Let your hair down once in a while… and bark like a dog for no reason.